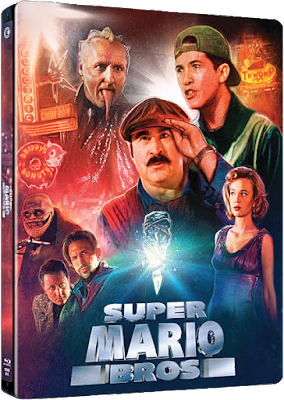 THE B-MOVIE NEWS VAULT: This Valentine's Day, get your bad movie lover the ultimate gift: SUPER MARIO BROS. - THE MOVIE (LIMITED EDITION STEELBOOK)! This Valentine's Day, get your bad movie lover the ultimate gift: SUPER MARIO BROS. - THE MOVIE (LIMITED EDITION STEELBOOK)! Few things were as disappointing to a very young Vault Master than 1993's SUPER MARIO BROS. - THE MOVIE. It's hard to believe that this awful adaptation of a popular video game franchise came out the same year as the ground-breaking JURASSIC PARK! But you know what? As bad as it is, I kind of love this movie. 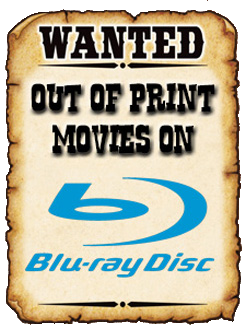 In some sick, twisted way, I enjoy it, and I simply must have it in my Blu-ray collection! The only problem is that this disc is Region B encoded, so it looks like I'll be snapping up a region free Blu-ray player in the very near future! Synopsis: Brooklyn plumbers Mario (Bob Hoskins) and Luigi (John Leguizamo) get the shock of their lives when they discover a parallel world populated by the intelligent descendants of dinosaurs! It seems they weren't destroyed by a meteor millions of years ago but hurled into another dimension and now have plans to rule our world. It's up to our unlikely heroes to battle the evil King Koopa (Dennis Hopper) and his Goomba guards, free the beautiful Princess Daisy (Samantha Mathis), and save mankind in this adventure of a lifetime! This Ain't No Video Game - A brand new 60-minute documentary featuring new interviews with Co-directors Rocky Morton and Annabel Jankel, Producer Roland Joffe, Actors John Leguizamo and Richard Edson, Writer Parker Bennett, Production Designer David Snyder, Art Director Walter Martishius, FX Artists Paul Elliot, Vincent Guastini and Rob Burman, Visual FX Designer Chris Woods, Editor Mark Goldblatt and Creature Designer Patrick Tatopoulos. Archive interviews with Bob Hoskins and producer Jake Eberts. The new SUPER MARIO BROS. Limited Edition Steelbook is currently a ZAVVI exclusive and can only be ordered HERE. The cost is fifteen pounds (or $19.67 in U.S. currency) + shipping and once again, this disc is Region B locked, which means that you must have a Region Free player to enjoy(?) this Blu-ray! And if twenty bucks is too rich for your blood, you can get a much cheaper standard Blu-ray release (also Region B) HERE at Amazon.com! Scream Factory's 2017 Release Calendar! New DVDs & Blu-rays for 01/03/2017!